When I wrote about my favourite Sarah bands earlier, I forgot to mention St. Christopher and Another Sunny Day of course and... The Springfields! 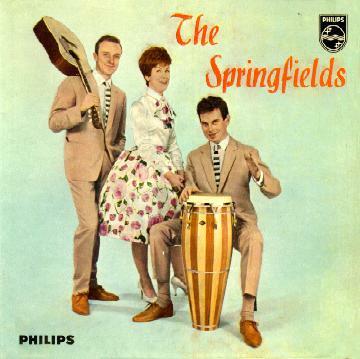 It's been hard to find an adequate follow-up to DROP 7, but if there is one it has got to be The Springfields, and especially their first single "Sunflower" which was attributed the tenth number (what a coincidence...) in the Sarah catalogue. With it's three guitars sounding as immaculate as any musical instruments ever has and its tranquil sixties melodies, it's sheer pop perfection. As you can see from the picture there were apparently more than one The Springfields. As I found out from Nixon-Roger's blog, this was the band Dusty Springfield was originally in. It's a nice cover though, don't you think? thanks a lot. and thanks for posting about my blog and the budgies! too bad your archive disappeared. i still haven't read that budgies review, you know. as for the record it's from this summer and not the last. the link should be working now. it leads to the radio show i used to do back in sweden. i just sent the application for a new show here in glasgow, so cross your fingers! Hey! The archive of Think Small from 2002 to the summer of 2005 is still there - it's only the year after that that got lost - and here's that Budgies review.